This chapter considers the findings specifically related to our Glasgow (Scotland) and Rotterdam (The Netherlands) case studies. The context of both is considered in terms of their office markets, social-economic trends and planning contexts. The way office-to-residential change of use is governed in both is explained. For Glasgow, interviews with a range of local stakeholders to gather their views on office-to-residential permitted development (PD) are summarised. Case study buildings are overviewed, and the differences seen when planning regulation apply suggested. For Rotterdam, there is a discussion about residential quality and an overall outline of the approach to governing the issue taken in the Netherlands. The way there has been less emphasis on deregulation and more of a steering role for the national and local state there is explained. 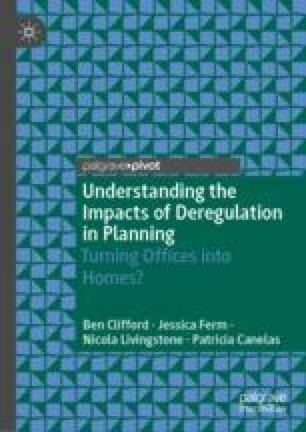 The chapter concludes on the positive features of such alternative approaches to governing office-to-residential conversion, questioning the necessity of the deregulation seen in England. British Listed Buildings. (2017a). Glasgow, 9-11 Lynedoch Street. https://www.britishlistedbuildings.co.uk/200405699-glasgow-9-11-lynedoch-street-glasgow#.We0bgohryUk. Accessed 20 October 2017. British Listed Buildings. (2017b). Glasgow, 187-189 Old Rutherglen Road, Weaving Factory, Main Mill. https://www.britishlistedbuildings.co.uk/200377259-glasgow-187-189-old-rutherglen-road-weaving-factory-main-mill-glasgow#.We4U2zBi-71. Accessed 20 October 2017. CBRE. (2012). Rotterdam Central Business District. An Insider’s View. http://www.cbre.eu/portal/pls/portal/res_rep.show_report?report_id=2635. Accessed 30 October 2017. CBS. (2016b). Transformaties op de woningmarkt, 2012–2015. https://www.cbs.nl/nl-nl/maatwerk/2016/43/transformaties-op-de-woningmarkt-2012-2015. Accessed 29 September 2017. Cushman and Wakefield. (2016). Glasgow Offices: Q4 2016. http://www.cushmanwakefield.co.uk/en-gb/research-and-insight/2017/uk-regional-offices-q4-2016/. Accessed 20 October 2017. Dutch News. (2014). Eight Million m2 of Offices Are Vacant in the Netherlands. https://www.dutchnews.nl/news/archives/2014/10/eight_million_m2_of_offices_ar/. Accessed 29 September 2017. Gemeente Rotterdam. (2017a). Transformatie Vastgoed. https://www.rotterdam.nl/wonen-leven/transformatie-vastgoed/. Accessed 29 September 2017. Gemeente Rotterdam. (2017b). DEF Navigator 2017. http://evr2017.publizines.nl/files/3914/8950/8139/DEF_navigator-2017_leaflet_002.pdf. Accessed 29 September 2017. Glasgow City Council. (2017d). Online Planning. https://www.glasgow.gov.uk/index.aspx?articleid=17240. Accessed 23 October 2017. JLL. (2017b). Refurbs to Dominate Glasgow Office Market in 2017. http://www.jll.co.uk/united-kingdom/en-gb/news/3030/refurbs-to-dominate-glasgow-office-market-in-2017. Accessed 20 October 2017. Keeton, R. (2014). Rotterdam Is Drowning in Empty Office Space. https://nextcity.org/daily/entry/rotterdam-is-drowning-in-empty-office-space. Accessed 29 September 2017. Knight Frank. (2016). Dutch Office Market Report Occupier Market Trends in the Randstad. http://content.knightfrank.com/research/233/documents/en/2016-3615.pdf. Accessed 31 October 2017. Ministerie van Binnenlandse Zaken en Koninkrijksrelaties. (2011). Transformatie kantoren gaat niet vanzelf: onderzoek naar onorthodoxe maatregelen in tien cases. http://www.transformatieteam.nl/news_posts/transformatie-kantoren-gaat-niet-vanzelf/. Accessed 29 September 2017. NRS. (2017). Scotland’s Census: Area Profiles. http://www.scotlandscensus.gov.uk/ods-web/area.html. Accessed 20 October 2017. Remøy, H. (2015). Hilde Remøy: Rotterdam Transformation Team Effective. https://www.tudelft.nl/en/2015/bk/hilde-remoey-rotterdam-transformation-team-effective/. Accessed 29 September 2017. RVO. (2017a). Transformatie. https://www.rvo.nl/onderwerpen/duurzaam-ondernemen/gebouwen/stad-en-regio/transformatie. Accessed 29 September 2017. RVO. (2017b). Samenwerking tussen vastgoedeigenaren en gemeenten. at https://www.rvo.nl/sites/default/files/2017/09/Transformatie%20en%20beleggers.pdf. Accessed 29 September 2017. Sharp, T. (2013). Glasgow Shopping Hotspot Sold for £10,500,000. http://www.heraldscotland.com/business_hq/13091719.Glasgow_shopping_hotspot_sold_for___10_5m/. Accessed 20 October 2017. Statista. (2018). Total population of Rotterdam from 2007 to 2017. https://www.statista.com/statistics/753250/total-population-of-rotterdam/. Accessed 2 September 2018. Tay Letting. (2017). Penthouse, 8 Buchanan Street, City Centre, G1. http://www.tayletting.co.uk/properties/5ps40a-penthouse-8-buchanan-street-city-centre. Accessed 20 October 2017.